HB Communications doesn’t boast the same eye-popping revenue growth numbers as many of 2018’s other Fast-Growing Integration Firms, but the North Haven, Conn.-based AV integrator does boast something many of the rest of this year’s group don’t have: the Audiovisual Ecosystem. 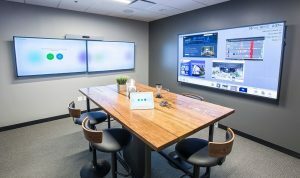 The Audiovisual Ecosystem project, as it’s been dubbed by HB staffers, is a massive overhaul of the company’s headquarters that represents a new way to tell the company’s story, not only to its customers and prospective clients, but also to its employees who may not otherwise understand exactly what the company for which they work does for those customers. “We have an opportunity to re-energize our organization,” CEO Dana Barron told CI during a visit to the new HQ in December. “Instead of just selling technology, we can help them understand it. “[By building a video wall in our headquarters], it immerses our own employees in what we do. “Many of our employees don’t know why big companies build spaces like this. It’s about creating a comfortable environment and increasing productivity,” Barron says. Barron is excited about how the Audiovisual Ecosystem is transforming the company his father Mackey founded in 1946. HB Communications modeled a variety of meeting rooms, each with distinct purposes, as part of its Audiovisual Ecosystem project. Barron pointed to some of the world’s largest and most successful companies and says part of what helps them attract top-level employees is the environment in their offices. That’s what he hopes the HB Communications Audiovisual Ecosystem will do for his company. “They build it because they’re trying to attract and retain top talent,” he says. Barron is especially proud HB’s six pillars are reflected in the Audiovisual Ecosystem installation. “We have content created from our broadcast group. We have digital media and signage, which is another pillar, which you see right when you walk in,” he says. “Then you have collaboration, and you see collaboration technologies when you walk into the rooms, and then you have the managed services, which is the support element of this whole thing. “This whole room is supported by that room. So, we have our own SLA with our managed services group. “Then, when we have an event here, our HB Live will come in and plug in, and we’re all set to create a live event. So, when you look at, in one space, people can understand what we do,” says Barron. Dan Barron, head of brand strategy for HB Communications, was the mastermind behind the Audiovisual Ecosystem. The elder Barron says the project started as a simple renovation but evolved into much more. 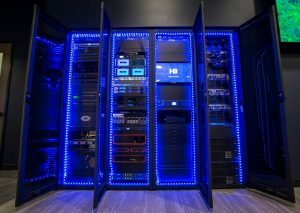 To give you an idea of how massive the HB Communications Audiovisual Ecosystem project really is, here’s a closer look at the rack system in the company’s control room. “We’re not just talking about the tech that’s in here,” says Dana Barron. It took a while for HB employees to understand it was OK for them to grab a coffee and hang out in the new space while they worked, says Dana Barron. “We have a whole directive around the adoption of this space. We built this thing, and people weren’t using it, or felt they couldn’t use it, or what have you,” he says. 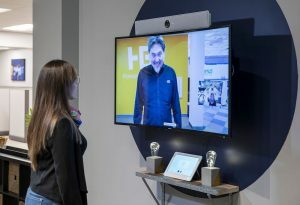 HB has 24/7 global service coverage, thanks to a partnership in Singapore that covers off-hour emergency calls around the clock when HB staffers aren’t available, although they’ve got it handled from about 7 a.m. to 10 p.m. and have a massive video wall that tells everyone the status of every customer at a glance. 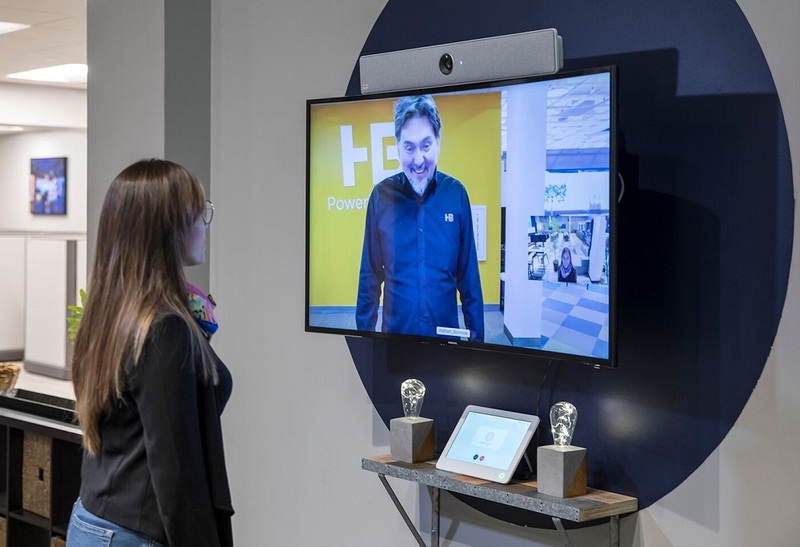 The wormhole feature in every HB Communications office allows employees to have impromptu video meetings or just chance encounters with their coworkers. Thanks to a massive video wall that gives HB’s service department all the metrics they could possibly need, “you can kind of see the health of our business. “I’m not talking about the financials. I’m talking about service delivery,” says senior VP Peter Charland. HB’s service department tracks client satisfaction, meeting completion percentage, accuracy of scheduling meetings and other metrics. If customers aren’t happy with the way the tech HB installs for them is helping their business, HB is at risk of paying penalties. “One of the reasons we’re growing is our win rate,” says Charland. “When we’re invited to the dance on a large-scale contract, our win rate is phenomenal for that very reason, because we will substantiate in a contract what our particular commitments are to availability, meeting success rates, associate satisfaction. “We’ve built the metrics to collect the data. We report on it. “So when a client is spend-ing $1 million or $2 million a year and we can create demonstrable value in return to the business by that investment, with that data, in the contracts, that hold us accountable with penalties on us if we fail to deliver, that’s the IT-outsource model.